MotoGP - Repsol Honda's Pedrosa to miss Catalunya GP | IAMABIKER - Everything Motorcycle! 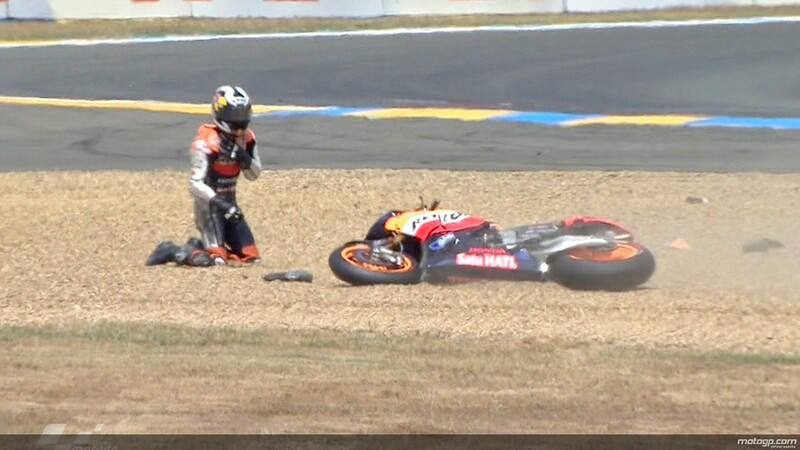 The Spaniard had surgery on the 18th May to repair a fractured right collarbone caused during his crash in the Le Mans race. It was hoped that through rehabilitation he would be ready to participate this weekend in the Grand Prix of Catalunya, however, due the bone healing slower than anticipated he has been forced to follow a more conservative treatment. How the injury heals from this point on will determine the timetable for his return to competition. Casey Stoner and Andrea Dovizioso, arrive at the Catalan circuit with Dani in their thoughts but also very motivated after their 1-2 at Le Mans. This year the circuit celebrates its 20th Anniversary since first opening its fantastic facilities to the World of Motorsports in 1992. Historically Honda has performed very well in Catalunya and has never failed to place a rider on the podium, apart from in 2009. Over these two decades the MontmelÃ³ grandstands, with a capacity of 104,000 spectators, have enjoyed 31 Honda rider podiums. Dani Pedrosa: “After France, I had surgery to stabilise the fracture of my right collarbone and hoped to be ready for Barcelona. I pushed myself as best as I could but I feel that my collarbone is not yet ready. I think I must rest for a while and recover properly. Since early this year I’ve had many problems and operations and I really believe I must stop now and let this heal properly. I would love to be in MontmelÃ³ with all the fans that follow me but for me if I’m on track, I’m there to fight for victory and offer them a good race. I feel that is not possible at the moment and therefore the most sensible thing is not to compete. It is a big shame what happened. Despite all the problems I had earlier in the season, this year I felt very strong and I was aware that I could beat my opponents. I want to say thank you to you all for your support and hope to be back in full shape as soon as poss ible to continue giving my best”.